Pixowl's The Sandbox places players in the role of a fledgling deity, grants them the power of pixel-particle elements, and sets them loose in their own single-screen world, free to do as they please. What pleases them seems to be drawing fan art. Starting with a blank canvas, players can lay down some water and add a pile of rock, generating sand. Adding soil to water creates mud. Turning on the sun creates condensation, which can form clouds. Adding steam to clouds generates lightning, creating electricity. Drops seeds to grow trees, and then turn the temperature to hot to watch them burn to the ground, leaving behind coal. Completing goals earns mana for unlocking more elements (as does dropping cash in the in-game shop), ultimate giving players some 30 different particles to play with. There's ridiculous potential here. And folks are using that potential to make pretty pictures. And I have no problem with fan art, especially fan art in The Sandbox, because all of these images players are creating can be downloaded and fooled with via the game's community features. 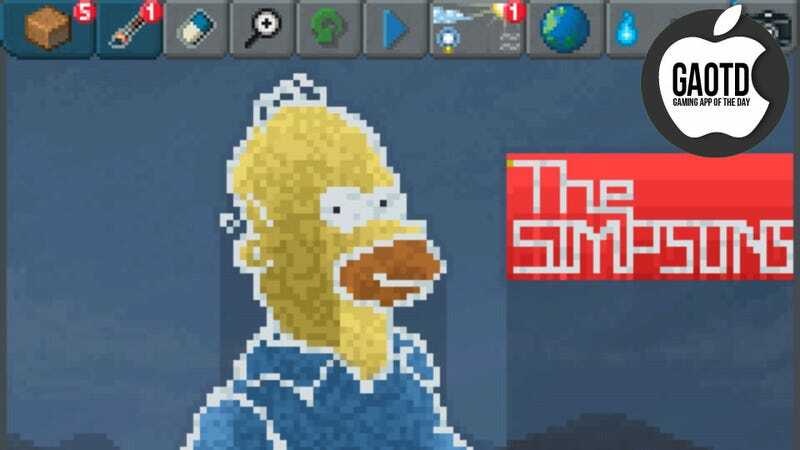 Someone else created that Homer Simpson up top, but I can download him, set the temperature to very cold, and watch as his component elements react. So even if you haven't got a creative bone in your body, The Sandbox still have plenty to offer. Take on the role of a vengeful god, downloading other worlds and setting them on fire. You are the apex predator! The Sandbox is now available for free on iTunes. That's an amazing deal for the power to become a pixel-art god.